Attracting talented job candidates is one of the biggest challenges facing HR in the next 10 years. Understandably, organizations want top talent and they are highly focused on recruiting strategies that enable them to hire the very best. 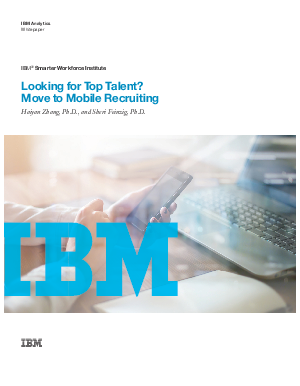 One increasingly popular strategy is mobile recruitment. As mobile devices become ever more ubiquitous, potential candidates are starting to look more favorably at organizations offering a mobile recruitment option. But are all candidates created equal when it comes to mobile recruitment? We decided to take a look at the coveted members of the workforce and explore their use of and attitudes towards mobile recruitment.